As July begins, while two small benches have been won at the Security Council stakeout, there is no access for the press or public to the new General Assembly hall hin the North Lawn building. The Free UN Coalition for Access raised this to the top of the UN Department of Public Information on June 10, and was told that somehow this is not different than before (ignoring the access to the fourth floor balcony over the GA Hall), but that a media worktable in the photo booths above the temporary GA Hall would be looked into. Eighteen days later on June 28 as the GA voted on the UN Peacekeeping budgets, there had been no change, no table. Such a table, which existed in front of the Security Council before and during the relocation, must be restored at the stakeout and GA access must be restored: this FUNCA has stated to DPI. DPI’s most recently communications have focused on trying to force the removal of even a single sign of the Free UN Coalition for Access, by threatening the suspension or withdrawal of accreditation. (Here is a picture of the sign, by FUNCA co-founded Luiz Rampelotto.) We called that censorship, and maintain it. The “Media Access Guidelines” to which the Association that does not want to be named is nevertheless a party, are anti-free speech and anti-access. We oppose locked up space for that Association while other reporters don’t have work space. 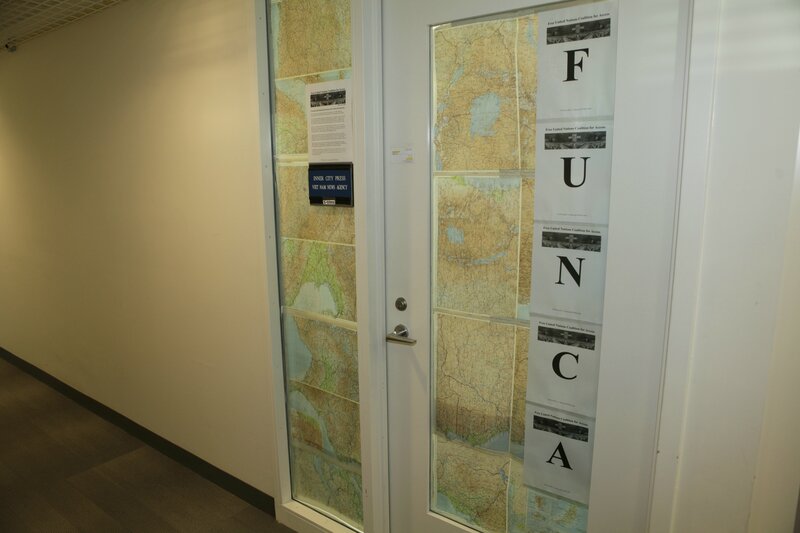 FUNCA has also raised to DPI the exclusion of resident correspondents’ guests from anywhere on the second floor. This was not the case in the past, and stands in contrast to those who come with guest badges on to take their photographs with the flags. This must be explained, as must all of DPI’s double standards, including on the issuance of white P resident correspondent passes. FUNCA aims to hold the UN to its stated purposes, by making it transparent and accessible without discrimination. This entry was posted in Inside the UN on June 29, 2013 by admin.